The mysterious yet finger-licking delicious berry pulao comes in a variety of versions: with chicken, mutton or egg. However, vegetarians needn’t feel disappointed as there is a special vegetarian version too (much to the amazement of puzzled non-vegetarians reading this). The special dried red berries that give you a tangy, citrusy flavour are imported in huge numbers from Iran and are unique to this restaurant. Try it once and you’re sure to keep coming back. After all, what choice do you have—you’re never going to find out the secret ingredient to replicate the dish! Why: A milky drink usually made with rose syrup, vermicelli, takmaria seeds (also known as sabjah) and ice cream, the falooda is a popular beverage in Mumbai. It is originally from Persia where it was first consumed as a mix of noodles and ice. Vermicelli was added next, followed by the addition of rose water and sugar as people began trying different techniques. In Mumbai, falooda is best served at the Badshah Cold Drink House in Crawford Market. A 100-year-old establishment, Badshah was started by B.A.Badshah in the early 1900s. I can personally attest to have visited the place with three generations of women in my family: my grandmother, my mother, my nine-year-old niece and I. In fact, we’ve brought dozens of relatives here who visit Mumbai not only from different cities in India, but also those from USA. While Badshah’s royal falooda—with rose syrup—is a common favourite, you can also try the chocolate, kesar, mango, blackcurrant, strawberry and butterscotch flavours. A daytime drink or a late night dessert, the popularity of the drink is so immense that Badshah now offers ready-to-go sealed plastic falooda-filled glasses. Why: In Mumbai’s fast-paced life, it is only fitting to have a snack that’s perfect to consume whilst making a dash for the ever-crowded trains and buses. One of Mumbaikars’ favourite grab-and-run snacks, the vada pav is like the Indian version of the burger and is available outside almost every train station among other local chai stalls. 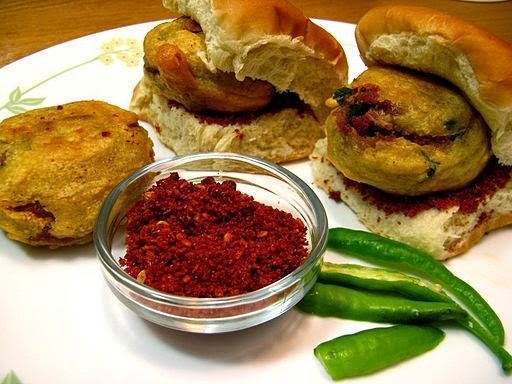 The patty, in this case, the ‘batata vada’ comprises a mixture of mashed boiled potatoes, coriander powder, red chilli powder, sliced green chillies, a pinch of ginger and sometimes garlic, which is then dipped in a chickpea flour batter and deep fried till golden. This is then stuffed between a pav that is coated with spicy green chutney and an optional red-coloured garlic chutney. While the recipe may differ very slightly depending on where you eat it, the vada pav is best eaten hot. Many people eat it while drinking chai, but it’s best to pair it with something that’s cold and sweet. A classic street food, it’s super cheap and quickly prepared for you to pick up in a hurry. But be warned; it’s not for the faint-hearted. Try it only if you’re not afraid to spice up your palate and ignite your digestive system. By Air: Mumbai is well-connected to major cities in India and overseas. You can take Spicejet or other domestic flights to reach the city from other Indian destinations. By Rail: Mumbai has two primary railway networks. Central Railways and Western Railways comprises. You can find the schedule online. By Road: The city has good motorable roads leading to nearby states in northern and southern India.